The chip draw, disc voucher winner this week was Dan Dancoe. The Disc For Points Earned winner was Doug Blighton. 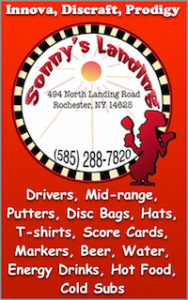 Take the disc voucher to Sonny’s Landing and exchange it for ANY disc on the racks in the store. Individual scores:NOTE: The team scores are used for the League Point Totals. There is a link to the League Point Totals at the bottom of the post. Click this link to View Point Totals.